It was 5 a.m. and dark outside when I left home for my daily walk one morning. 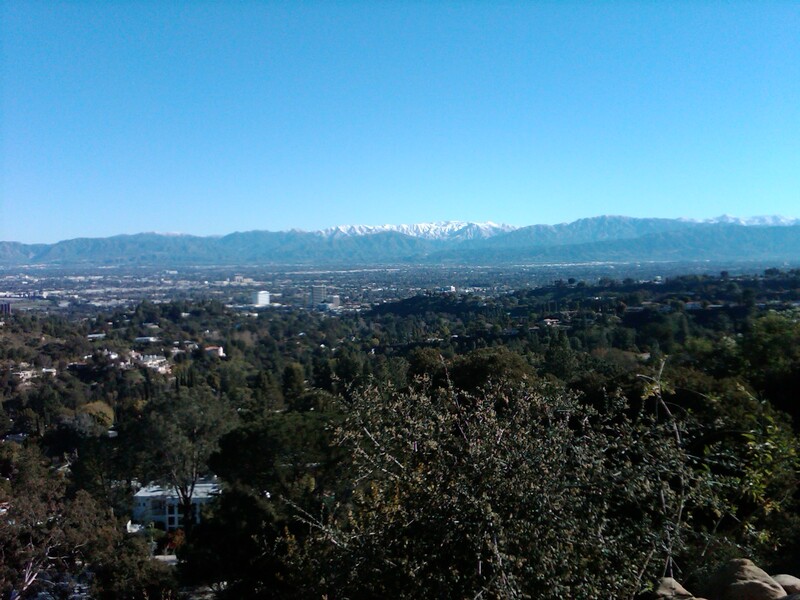 It was cold and windy, but I was clothed warmly for the five-mile trek along a route that included a steep stretch of road into the hills above our neighborhood of Granada Hills, one of the towns in the San Fernando Valley, just outside Los Angeles. I was eager to walk that morning, for I was deeply troubled about my life and needed to work off a lot of pent-up frustration. But even more importantly, I needed the time of solitude and privacy along those deserted and darkened roads to pray and seek God’s help and direction. As I walked I poured out my frustrations to God. I told him how burdened and beaten down I felt, and how I had lost the passion, dream, and direction for my life. A scene from the past flashed in my mind, one that I had seen many times from our church which sits atop one of the ridges of the Santa Monica Mountains, overlooking the San Fernando Valley. It was a scene of a high-flying bird—sometimes an eagle, sometimes a hawk—hovering or slowly gliding majestically above the slopes. Its wings would always be spread wide, almost motionless, as it circled above unhurriedly under the California sun, as if waiting patiently for something. Inevitably it would connect with that something—an unseen thermal draft—its outstretched wings catching the full force of the swift-rising column of hot air that would send it soaring effortlessly to greater heights with hardly a flap of its wings and no wasted energy. As I walked up the steep hill in the dark that morning, I closed my eyes, spread out my arms eagle-like, and tried to imagine what it would be like to wait for those thermal drafts and soar like an eagle. The cold wind blew steadily on my face, chest, and outstretched arms, and I began to feel as if I were being lifted gently off the ground and borne aloft by the wind. Though my feet continued to pound the ground in a steady walk up the hill, my imagination took me to another realm where I seemingly experienced the sensation of flying like an eagle high above the San Fernando Valley, with the city lights shimmering and sparkling below and the dawn’s faint light gently washing the eastern sky. I felt as if I were hovering in the wind, gliding, waiting, and then soaring as a thermal draft swept me upwards and effortlessly to higher levels of flight above the valley. The sensation of flight was wonderful and thrilling, sending shivers through my body. But an even deeper sensation followed—an overwhelming sense of God’s presence and a feeling of total well-being. This was God’s touch of grace, his moment of blessing for one who was poor in spirit, and one who mourned (Matthew 5:3-4). · Never give up and quit. · Wait patiently for God and he will restore our flagging strength and spirit. · Trust God completely to do what he promises in his Word. · Rest quietly in him. · The Holy Spirit’s presence and will are to us what the thermal air currents are to the eagle or hawk. Always be joyful. Keep praying. No matter what happens, always be thankful, for this is God’s will for you who belong to Christ Jesus. Do not stifle the Holy Spirit. I’ve never been able to recapture that sensation of flying, but the lessons learned through that experience and those scripture passages have stayed with me, especially whenever I see one of those majestic creatures soaring over the slopes of our San Fernando Valley. Prayer: Dear heavenly Father, sometimes we find ourselves tired, discouraged, and utterly burnt out on life. Thank you for assuring us through your holy Word that if we wait patiently on you and seek your guidance, you will renew our strength, reinvigorate our flagging spirits, restore us to our rightful minds, and empower us to soar to greater heights of living and serving. Teach us to wait patiently, for it is in quiet waiting that we experience you in your fullness and transforming power. Amen. Several years ago, beginning in January of each year, a hummingbird built her nests and nurtured her young in the branches of a potted ficus plant on the sundeck outside our family’s dining room window. I first saw her when she started building a nest in the front of our house, just outside the window of my study. I felt very honored that she trusted me enough to build her nest just inches away from my window. I was always aware of her presence as she sat on her eggs and quietly watched me work at my computer. But during one February night that first year, a fierce thunderstorm blew in and deluged the San Fernando Valley region of Southern California where we live. The next morning I went outside and found that the wind and rain had snapped many branches off the trees in our garden and dashed her nest and eggs to the ground. I felt sorry for my feathered friend and wondered what became of her. Did she survive? Was it too late for her to rebuild her nest and lay her eggs again? My answer came the following year. As the rainy season approached in January, I discovered her building a nest in the ficus plant at the back of our house, about two feet from our dining room window. This time she chose her nesting area well, for the ficus sat in a large pot under the eve of our roof overlooking the sundeck, sheltered very nicely from the rain, hail, wind, and the sun. We watched as, over the weeks, she built her nest, laid her eggs, warmed her chicks, and nurtured them. She watched us as we ate our meals, cleaned up our dishes, had our family times around the dining room table, and let our cat out into the backyard. We watched as her chicks grew, exercised their wings, got too big for their nest, and finally took flight, leaving the nest. For three years I enjoyed her company each season and, with each empty nest, wondered how she and her offspring would fare over the coming year. Would the young ones make it? Would she return next year? 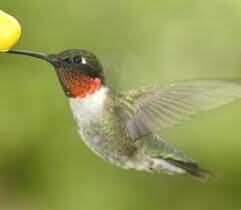 Were they among the many hummingbirds that drank from our backyard feeder throughout the year? I felt a very strong affection for her and her family, and I sensed that in some strange way a very special bond had developed between her and our family—a bond that brought her back again and again. Most of all, she and the many other feathered species that graced us with their presence and songs each day were vivid reminders to me to live each day without anxiety. Don’t worry about things—food, drink, and clothes. For you already have life and a body—and they are far more important than what to eat and wear. Look at the birds! They don’t worry about what to eat—they don’t need to sow or reap or store up food—for your heavenly Father feeds them. And you are far more valuable to him than they are. Will all your worries add a single moment to your life? And why worry about your clothes? Look at the field lilies! They don’t worry about theirs. Yet King Solomon in all his glory was not clothed as beautifully as they. And if God cares so wonderfully for flowers that are here today and gone tomorrow, won’t he more surely care for you, O you of little faith? So don’t worry at all about having enough food and clothing. Why be like the heathen? For they take pride in all these things and are deeply concerned about them. But your heavenly Father already knows perfectly well that you need them, and he will give them to you if you give him first place in your life and live as he wants you to. I have found great comfort in those words—especially when my fears and brooding imagination threaten to overwhelm me. There have been many mornings when my fear of facing the day has been quieted and stilled by the sight of birds in our garden and the memory of my special feathered friend who tended her young during those years. They remind me of a heavenly Father who loves and cares for us and promises to take care of not only our tomorrows but also our todays. So, dear friend, the next time you begin to feel anxious and worry, look at the birds and learn a simple but profound lesson from your heavenly Father on how to live each day without anxiety. Living in community — whether in a family, in a church fellowship, with coworkers, or within society at large — is not always easy for me. I find that in some ways I tend to be a loner and would much rather go off by myself to pursue my own agenda. Building and maintaining meaningful relationships is hard work, whether it’s within the community of marriage and family or in developing friendships with people outside our immediate circle. My tendency is to want to bolt and escape when the going gets tough, especially when friction arises in my marriage. My walls come up, my defenses harden, and my natural impulse is to pack my bags and flee to the ends of the earth. This impulse to flee to the ends of the earth seems to be a trait in my family. Generations in our family have been marked by absent fathers, shattered marriages, half brothers and sisters, and family roots and branches that spread far and wide — England, Ireland, China, Africa, the West Indies, the United States, Canada, and Australia. Part of me wants the freedom to roam the world, free from responsibilities that tie me down, and free from relationships that demand too much of me. But at the same time, part of me strives to break the pattern of broken marriages, absent fathers, and dysfunctional families and seeks instead to build and maintain solid communities — a loving marriage, caring family, a vital church fellowship, and an active, productive civic involvement. And it is in the fall and winter each year that skeins of migrating geese rekindle in me this desire to strengthen and build the communities in my life. As each bird flaps its wings, it creates uplift for the bird immediately following. By flying in a “V” formation, the whole skein adds at least 71% more flying range than possible if each bird flew on its own. When a goose falls out of formation, it suddenly feels the drag and resistance of trying to go it alone . . . and quickly gets back into formation to take advantage of the lifting power of the bird in front. If we have as much sense as a goose, we will stay in formation with those who are headed the same way. 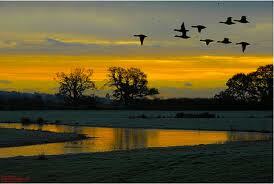 It is sensible to take turns doing demanding jobs, whether with people or with geese flying south for the winter. When a goose gets sick or is wounded by gunshot and falls out of formation, two other geese fall out with that goose and follow it down to lend help and protection. They stay with the fallen goose until it is able to fly or until it dies. Only then do they launch out on their own or with another formation to catch up with their group. Those thoughts and observations have remained with me over the years, lying dormant for a while, only to be reawakened by the sight of the geese flying overhead or congregating in the wetlands, lakes, and reservoirs around Southern California. On each occasion I marvel at the way God created these wild fowls and instilled in them this sense of caring and community. And inevitably I’m reminded of how God desires us to have that sense of community and caring, too, especially those who seek to follow Christ as members of His body, the Church. If I had the gift of being able to speak in other languages without learning them and could speak in every language there is in all of heaven and earth, but didn’t love others, I would only be making noise. If I had the gift of prophecy and knew all about what is going to happen in the future, knew everything about everything, but didn’t love others, what good would it do? If I gave everything I have to poor people, and if I were burned alive for preaching the Gospel but didn’t love others it would be of no value whatever. Love is very patient and kind, never jealous or envious, never boastful or proud, never haughty or selfish or rude. Love does not demand its own way. It is not irritable or touchy. It does not hold grudges and will hardly even notice when others do it wrong. It is never glad about injustice, but rejoices whenever truth wins out. If you love someone, you will be loyal to that person no matter what the cost. You will always believe in him, always expect the best of him, and always stand your ground in defending him. Yes, there are many times that, in my anger, haughtiness, and selfishness, I want to turn my back on the people in my life. Yet, again and again, the Spirit of Christ constrains me, convicts me of my sinfulness, then covers me with His grace and forgiveness, and sends me back into my communities to fellowship, love, and serve the other members of the body. And sometimes He simply uses a gaggle of geese to do it. Prayer: Father God, may your grace and love indwell us, enabling us to be patient and kind to one another. Forgive us for our selfishness, rudeness, irritability, and grudges. Teach us to forgive others as you have forgiven us, and may we be instruments of peace, healing, and harmony in our communities of brokenness as we pray and serve in the redeeming name of Jesus our savior. Amen.